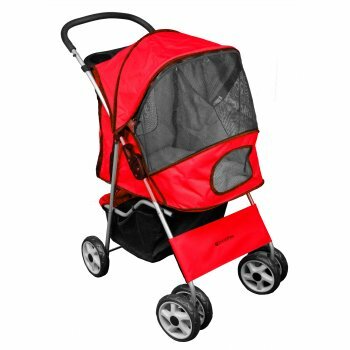 This is a wonderful, fold-flat 4 Large Wheel Flame Red Pet Stroller with a heavy-duty yet lightweight steel frame. The diameter of the wheels is approximately 6 1/2 inches. The rear wheels include locking brakes to ensure your pet stays safe when you decide to stop.